Last year when we were at Niagara Falls we so badly wanted to cross over the border to check out the falls from the Canada side. However, we did not have valid passports. So, we made it a priority to get passports for the whole family before this trip so we could cross the border if we wanted to. And we wanted to! 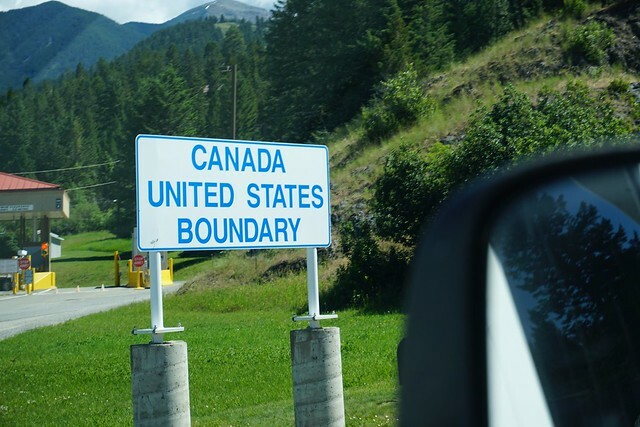 Brielle was so excited about going to a different country and the Canadian Rockies sound like an amazing place. On top of that, we had some friends that were going to be in the Banff area about the same time we were so we decided to hook up with them for a day. But first we had some logistics. Our last day in the Glacier National Park area we decided to keep pretty lazy and just stick around the Hungry Horse area. I worked in the morning, Steph made more travel plans and the kids read and vegged out. Later in the morning we went on an excursion to check out near by Lion Lake and the Hungry Horse reservoir. 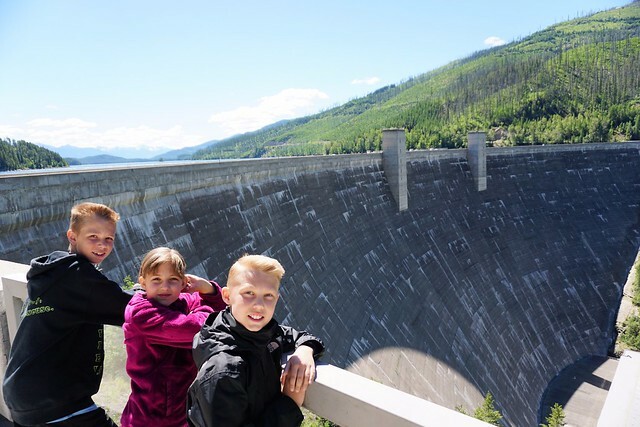 While at the reservoir we took a lot of dam pictures as this thing was pretty impressive…its the 10th tallest dam in the US! Looking over the edge made my tail bone hurt!! As we talked to several rangers on the west side of Glacier NP they all said that it was very much worth it to make the long drive around to see the east side of the park. Of course, there are a few months of the year you can get there in 50 miles on Going to the Sun road, but that was closed so we had to go around. While it was a long way to drive around we figured since we’ve come this far we might as well check out the other side. We packed a lunch, piled in the truck (even Sheba got to come along) and we headed off. When in Glacier National Park you HAVE to drive Going to the Sun road between the east and west sides of the park. Unless, of course, its closed. Apparently we are still too early in the season and the road is still being cleared of snow. While our timing was poor for that aspect of the park we showed up on a year of mass bear grass blooms! 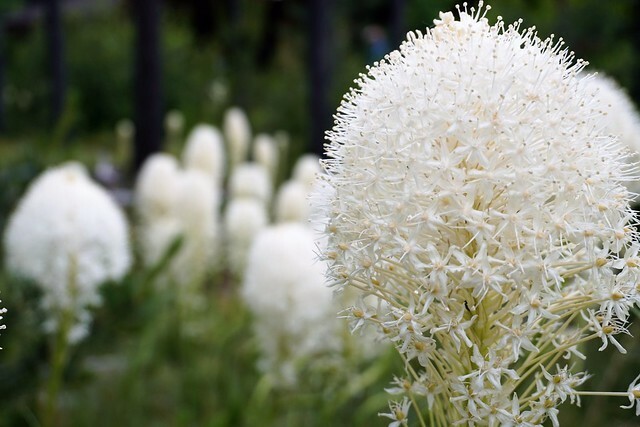 Bear grass (xerophyllum tenax) is a common wildflower in the park but massive blooms like they are having this summer are said to occur only every 5-10 years! It is Father’s Day today and I realized something. We are currently traveling and are at the headwaters of the Missouri river, a key location in Lewis and Clark’s expedition. Last year at this exact time we were at the Gateway Arch in St. Louis which is a memorial for those who made possible the western expansion of the United States including Lewis and Clark! So, it seems as though our new family tradition is to spend each Father’s Day doing something related to Lewis and Clark. Ok, maybe that’s a silly tradition, but I think its pretty interesting how we ended up on Meriwether and Williams’ path 2 Father’s Days in a row. The day started early with the furnace not working. Although I was pretty groggy I quickly figured out that it was a fuse related problem. When I went to pull the fuse the furnace kicked on and the fuse fault light went out. Apparently it had just come a bit lose. Whew! Next up on the docket is me driving into the little town of Three Forks MT to the CarQuest shop to borrow their scan tool (which they keep behind the counter in a Crown Royal bag) to see why the check engine light was on in the Beast. A P2599. That means that the turbo vane sensor showed a more open position that the ECM thought it was at. I cleared the code and am praying that it was just a fluke due to some really long and heavy driving yesterday through the mountains at 75MPH with a huge headwind.